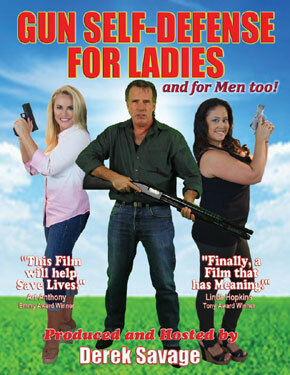 As crime and attacks escalate throughout the country, “Gun Self-Defense for Ladies” shows women, and men, from basic to advanced knowledge on guns, from pistols to shotguns, and how to protect themselves and their family! “This is such an Empowering Project, and timely. Karate Self-Defense, to getting your Concealed Weapons Permit! THIS WORLD IS GETTING CRAZY! When Seconds Count, the Police are usually Minutes Away. It is up to You to Protect Yourself and Your Family! Movies, Streaming Links, Sound Tracks, Books, eBooks, Audio Books, and Cool Cat Clothes! Pepper Spray is the large 2-once size, with up to a 12-foot spray distance. Stun Gun is 53-Million Volts, and is the Heavy Duty model. Comes with case. Must be 18 or older to order Pepper Spray or Stun Guns. It is 'Your Responsibly' to be honest. NO International orders on Pepper Spray or Stun Guns. also Illegal in the following cities/counties: Annapolis, MD; Baltimore, MD; Crawford County, IA; District Of Columbia. All orders with shipping to the above areas will be canceled and refunded. You must be 18 or older to purchase Mace or Stun Guns. No exceptions! "I just bought a new pistol, and this film helped me a lot! Thanks! "You have the RIGHT to self-defense and to defend yourself. EDUCATION and TRAINING are vital to safe operation, and this film provides that valuable education." Producer and Host Derek Savage is also the creator of Cool Cat.